Dedicated practice is the key to mastering digital accessibility. But with hundreds of rules and guidelines, it’s confusing and time-consuming to rely on a variety of sources for guidance. That’s when TPG’s KnowledgeBase comes in handy. You’ll be able to access everything you need to know about website accessibility in our comprehensive HTML-based digital repository. Maintained by our team of expert engineers, this robust accessibility resource contains detailed instructions for creating accessible code for your digital content. TPG has been a leader in the field of accessibility since 2002. Our experts are second to none; many are involved with the creation of the W3C guidelines themselves. Use the <label> element to explicitly associate a labelable form control with a visible label. 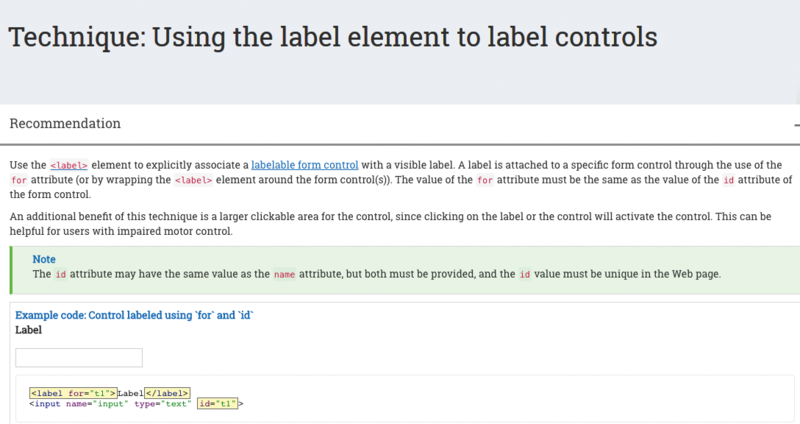 A label is attached to a specific form control through the use of the for attribute (or by wrapping the <label> element around the form control(s)). The value of the for attribute must be the same as the value of the id attribute of the form control. An additional benefit of this technique is a larger clickable area for the control, since clicking on the label or the control will activate the control. This can be helpful for users with impaired motor control. The id attribute may have the same value as the name attribute, but both must be provided, and the id value must be unique in the Web page. KnowledgeBase is accessible through ARC, TPG’s Accessibility Resource Center. ARC is a platform through which you and your team can access analytics, issue reports, eLearning modules, an extensive library of developer techniques, and support in a single location. For more information about KnowledgeBase, please use the form below. All fields are required. First Name is required. Last Name is required. Company Name is required. Phone Number is required. Email Address is required. Country is required. State is required. Comments field is required.